Below is a ForMor University (FMU) video featuring which is a dynamic training system that will empower your business and your life to the next level and beyond. Below you will find a ForMor Product video. 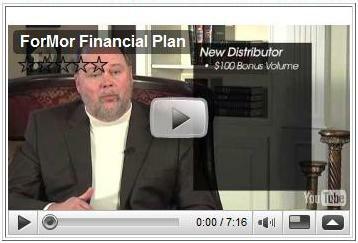 Below you will find a video describing in detail ForMor Financial Plan. Below you will find a video tour of ForMor facilities. Click on the picture below to start the video (English). Click on the picture below to start the video (Spanish). Below is a video highlighting some of the events at the ForMor 2008 Convention. To find out more about Cardio Cocktail, Argenix, Cardio Pack, Oral Chelate, EDTA, Omega 3, Omega 6, Omega 9, Arginine, L-Arginine, L Arginine, L-Citruline, MSM, and all of the other ForMor products please call us at 800-509-9746 or just send us email.